If you have been following TiptoeingWorld, you would be familiar with Marunouchi area. 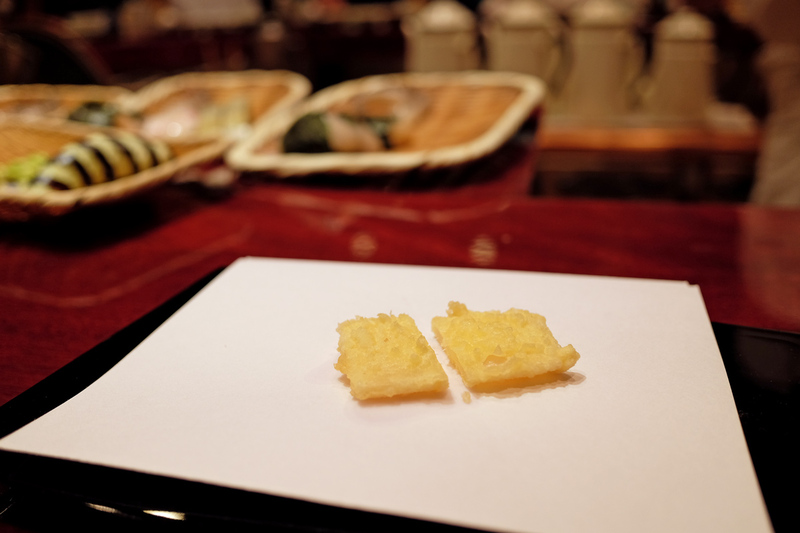 We love Marunouchi especially when it comes to a fine dining. The Marunouchi Building in Marunouchi is always favourite choice for our familly dinner. 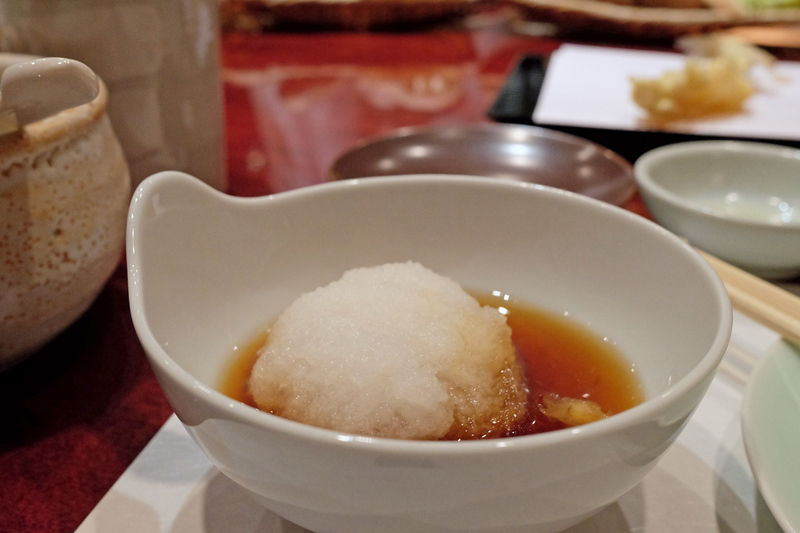 The area’s reputation as a home to many Tokyo finest restaurants is indisputable. Without any doubt we again chose Marunouchi as a place to dine in our final evening in Tokyo. 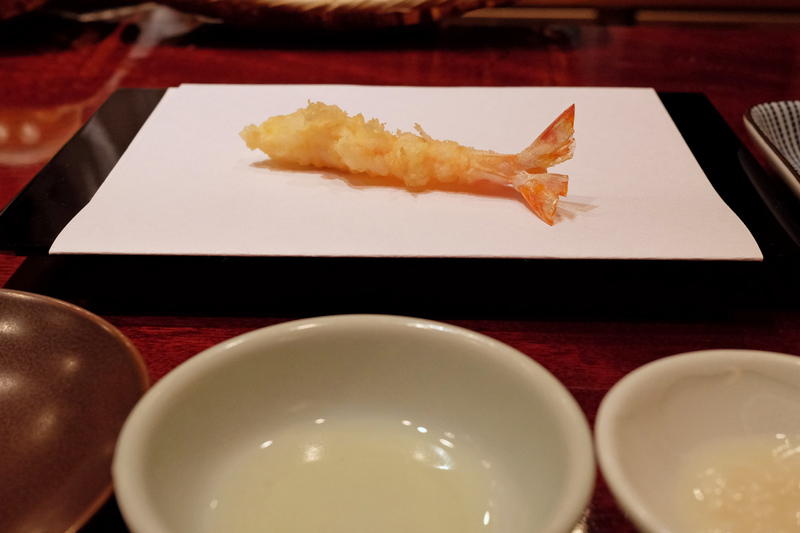 On our final night we were treated by my sister in law in one of Tokyo’s famous tenpura restaurant, Tenmasa Ozashiki. We are no strangers to Tenmasa Ozashiki thanks to my sister in law. 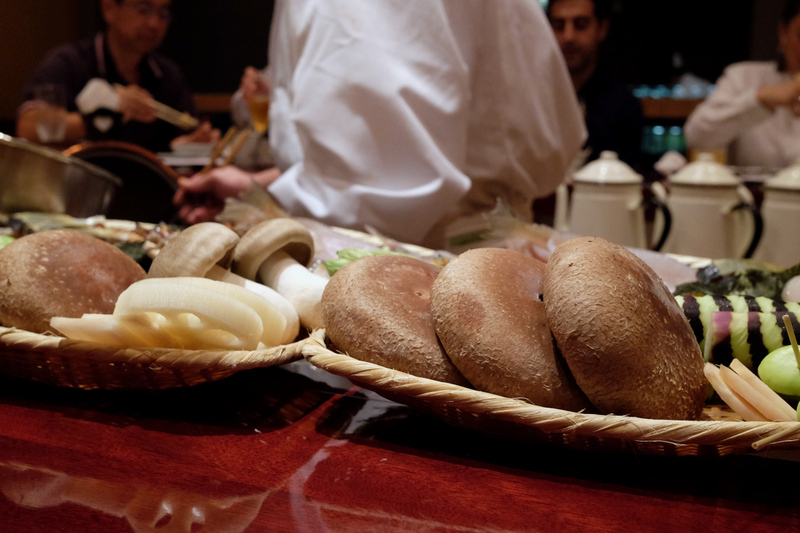 It’s one of our favourite restaurants in Tokyo (again thanks to my sister in law who always spoil us with good food). This restaurant is popular for both local and foreigners staying in Tokyo. This time we were slightly unlucky for not able to get a private room like we normally would whenever we dined in this restaurant. 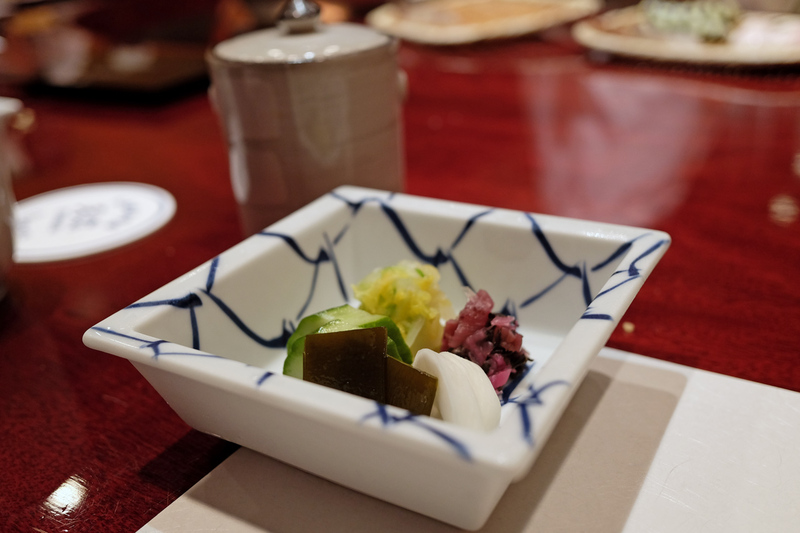 We were, however, fortunate enough to get space in a common dining room of Tenmasa in a short notice reservation. Dinner is always the busiest time for many restaurants especially in a business district like Marunouchi. Most of restaurants at Marunouchi Buildings on 35th to 36th floor are packed with businessmen who often host dinner for their guests. 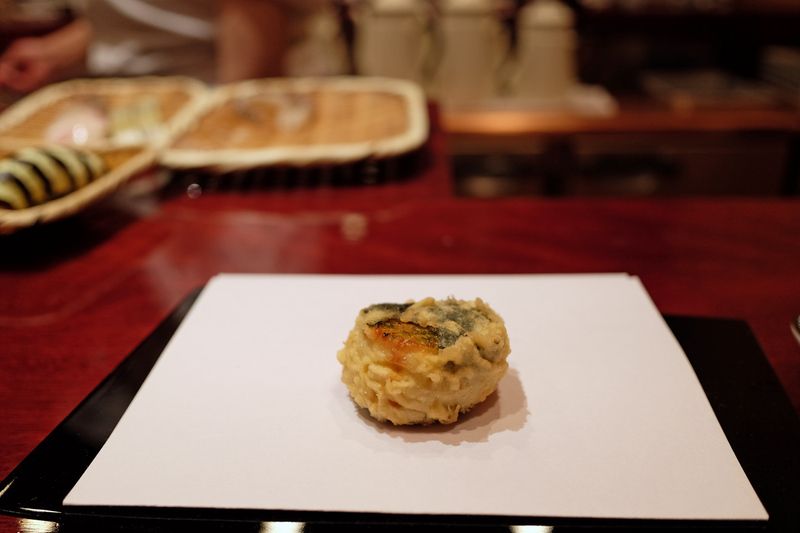 Tenmasa Ozashiki’s reputation as a good tempura restaurant has been known for a long time. The restaurant has been operating through three generations since it was first opened in 1936. 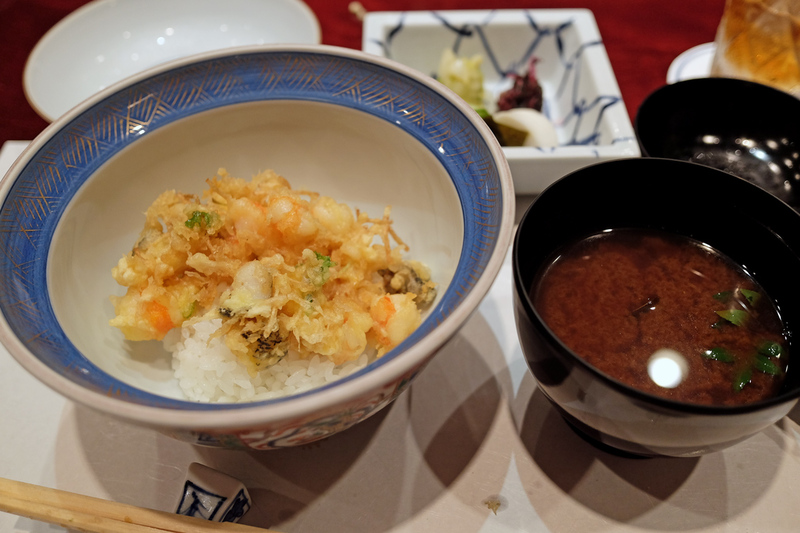 It serves wide varieties of fish and vegetable tenpura. 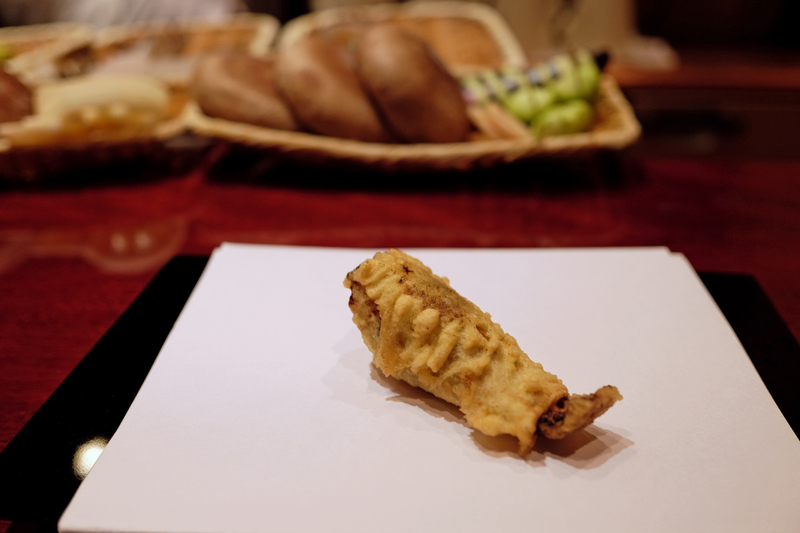 Its signature dishes: fresh prawn, fish and vegetables, light batter and the used of fresh oil. The dining rooms offer traditional counter seating up to sixteen people. This type of tatami (traditional woven rice straw mat for flooring) room is called ozashiki. 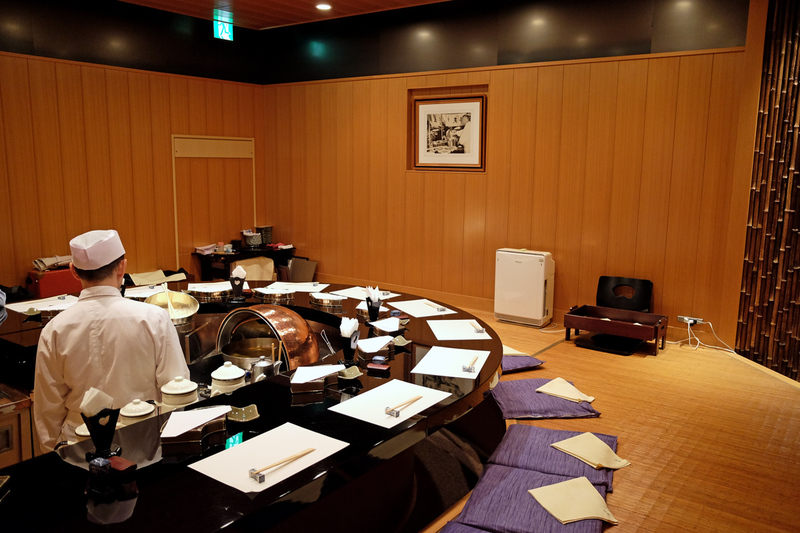 The word ozashiki is only used to name tatami room in restaurants where food and drink are served to guests. The chef prepares and serves the food directly to each guest while a kimono dressed waitress stands by to take drink order. An empty plate and four bowls filled in with different sauces were laid out in front of us. 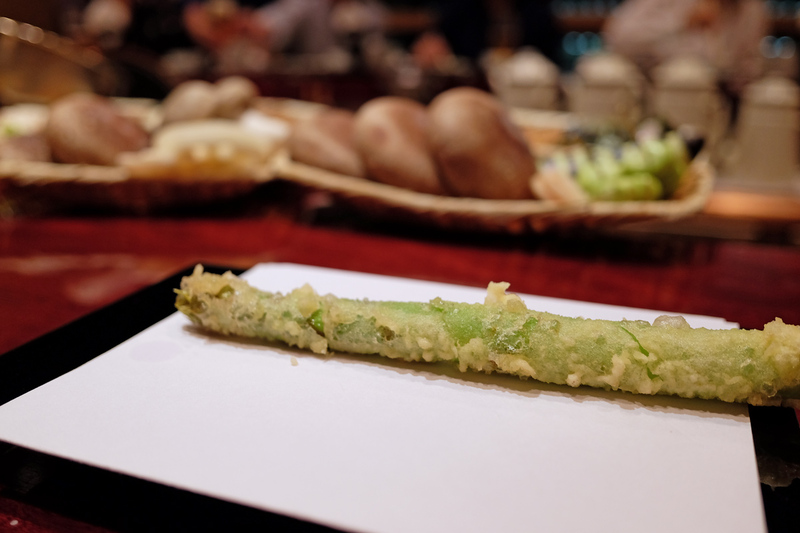 Hors d’oeuvre was a giant edamame immediately served on a plate. I tried to take picture but the chef gazing at me signaling his protest. I switched off the camera. 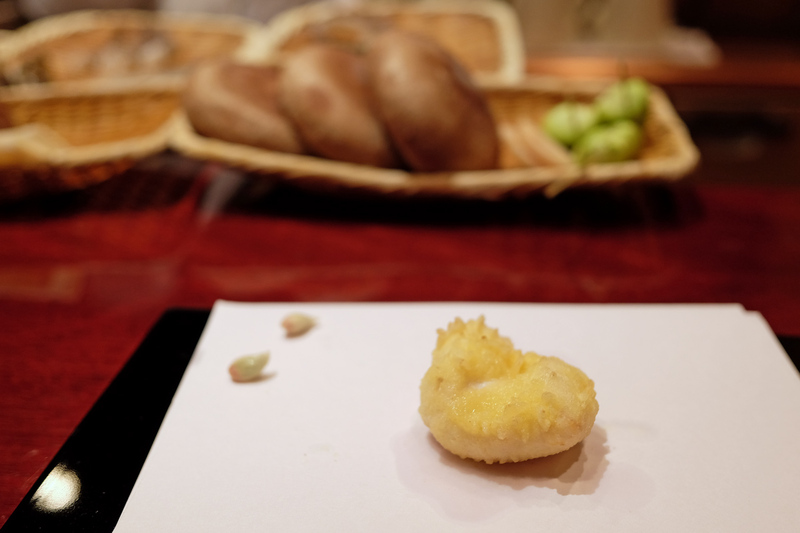 The chef then recommended to use salt to eat the adamame, he watched me eating as if waiting for my response. “Oishi (delicious)”, I said while still chewing. He looked happy then continued his work. In Japan, chef often gets offended when guest does not immediately eat the food served on the table. There are some stories guests were kicked out from another traditional Japanese restaurants because the chef was so upset knowing the guests preferred taking pictures than eating the food he prepared. So, I took these pictures while the chef was either cooking or serving other guests. I missed some of the food but that was fine. 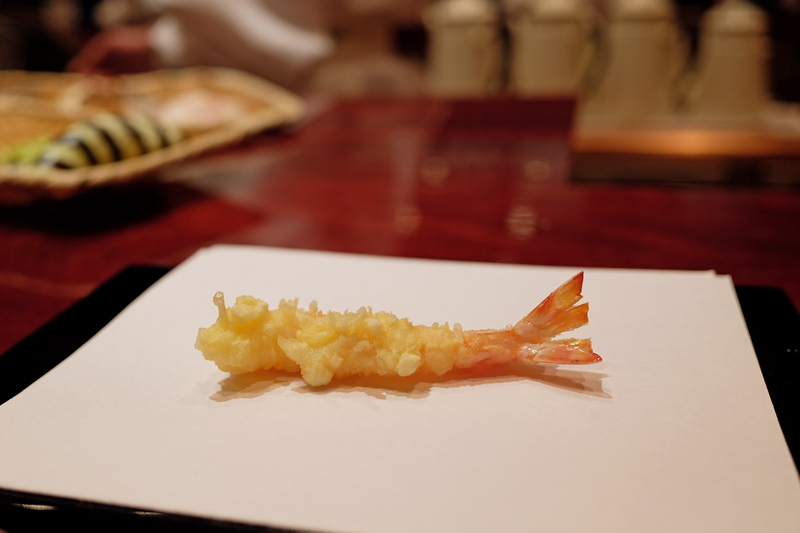 Next on the menu was a prawn tempura. This dish with soy sauce was my favourite dip-in sauce. Unlike many of soy sauce, this one was not too salty and tasted light. This was the most artistic eggplant I ever had. I could never remember the name of this seafood. Shitake mushroom before it was cut into four for the guests’ convenience. It was so fresh and delicious that I had to order additional mushroom. I have a heart for fresh mushroom. Ginger which got me into thinking that it was squid. Like in most of Japanese dining, rice would be served the latter in a small portion with dashi (clear broth), miso soup, pickles and wasabi. 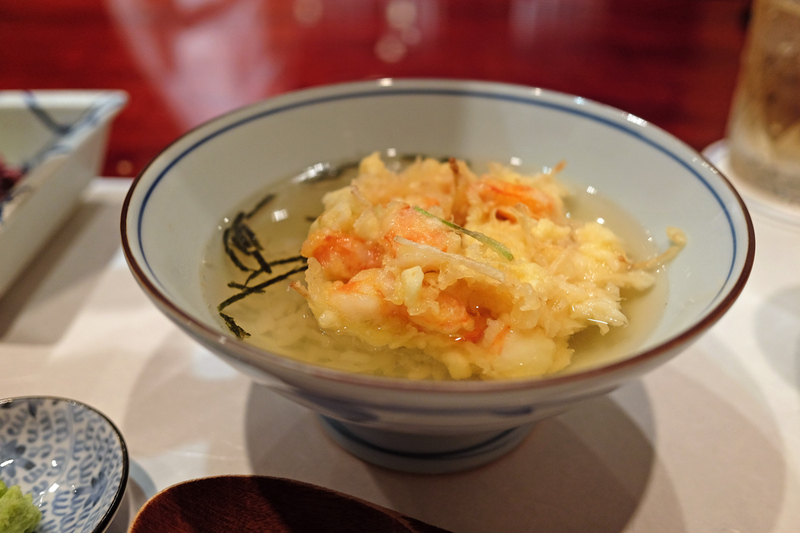 The dashi was placed in a porcelain tea-pot like, poured it into the bowl, the rice and tempura became ten-chazuke. The dining started with prawn and ending with prawn too. 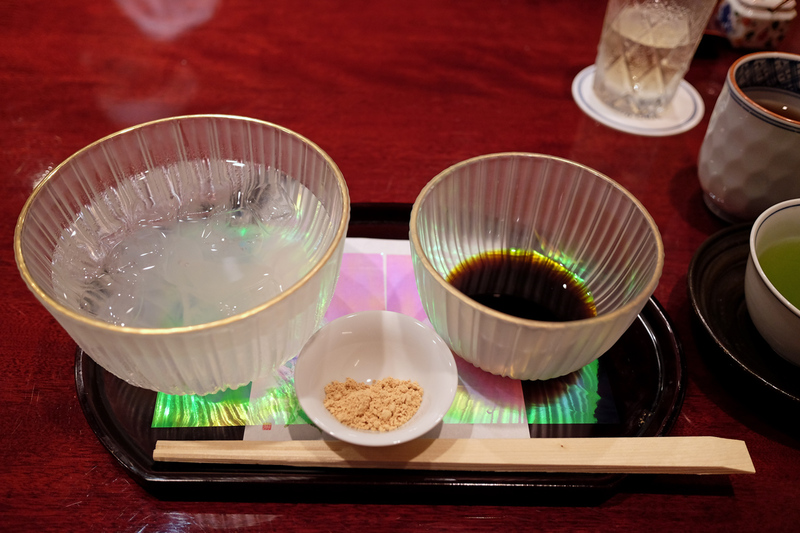 A traditional dessert set, kuzukiri, dark brown sugar syrup and sesame powder as the closing. Kuzukiri is a clear noodle made from arrowroot starch. It’s normally served in summer only and always cold. Was the price worth paying for? Of course it was. Dinner in Tokyo is always more expensive than lunch let alone in a famous restaurant in Marunouchi. 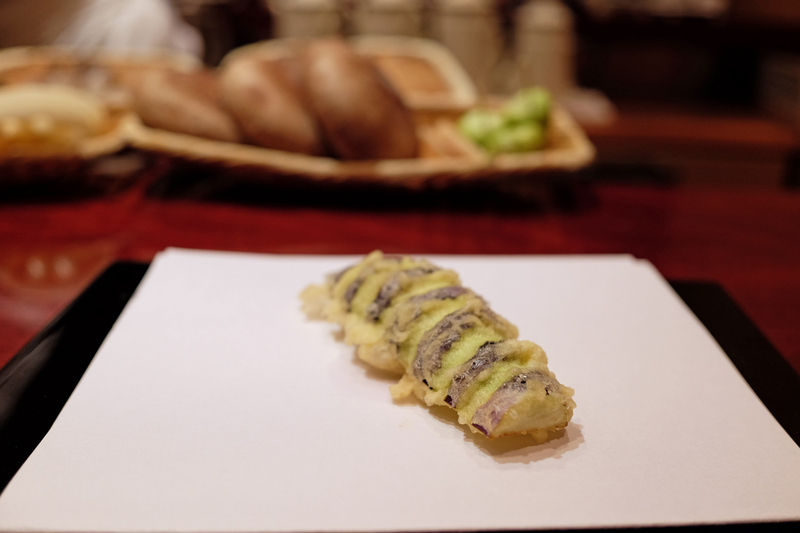 Dining in Tenmasa Ozashiki never disappoints. It always leaves something to long for at the next visit.. We were glad that our last family dinner of the year was in this restaurant, before we temporarily left Japan.